I finally decorated my Christmas Tree. Bought two sets of little battery operated lights (harder to find then you think!) in red and white. Not sure they are what I wanted but I guess they will do. 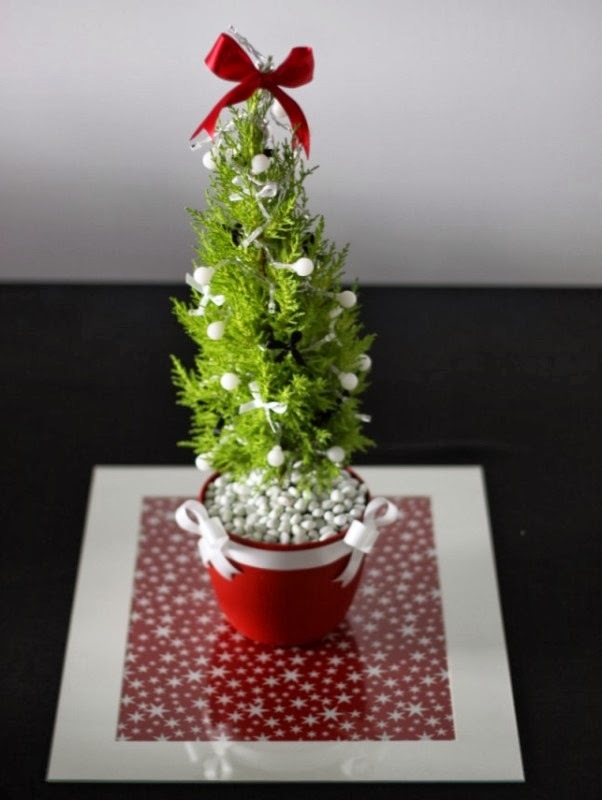 I also bought some red and white spherical bells for the tree, but they were way too heavy for the poor little conifer branches. I didn't think of that in my planning. So instead, I now have little satin ribbon bows as they are light enough to work. Reasonably happy with the result, it was lucky I had black, white and red ribbon in my craft stash though it would have been nice to have little red bows as well. 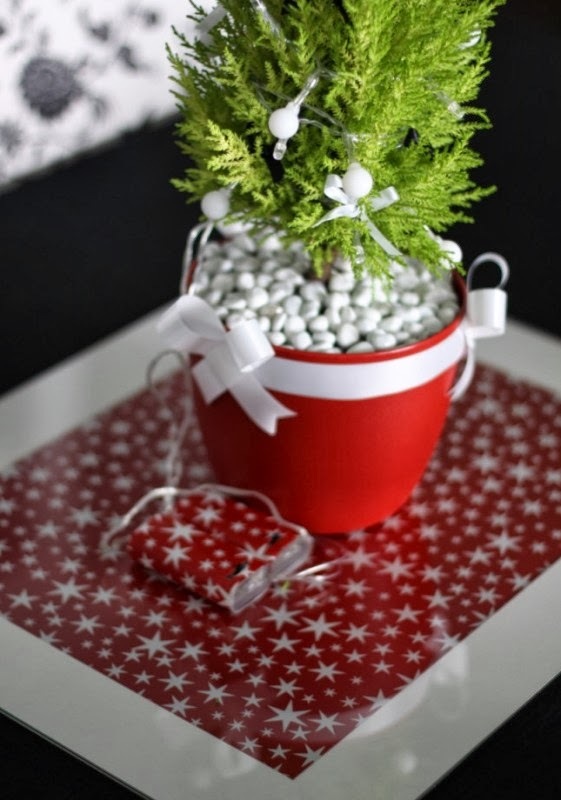 Also decorated the pot with the white ribbon and put some wrapping paper under glass to complete the centrepiece. With the lights on and the blinds shut. The 'hidden' side of the tree. As you can see my chairs are black and white so I think the ribbons match well. You can also see the battery packs for the lights, I covered them in the same wrapping paper just to make them a little less obvious. I have the same paper in white with red stars too, so my wrapped presents will match too. Don't have any to wrap just yet though. Spent the day in Ballarat yesterday with MissC, will upload photos once I've dealt with them. That is THE cutest tree ever! I love it! I think the ribbon instead of a star is a great touch. 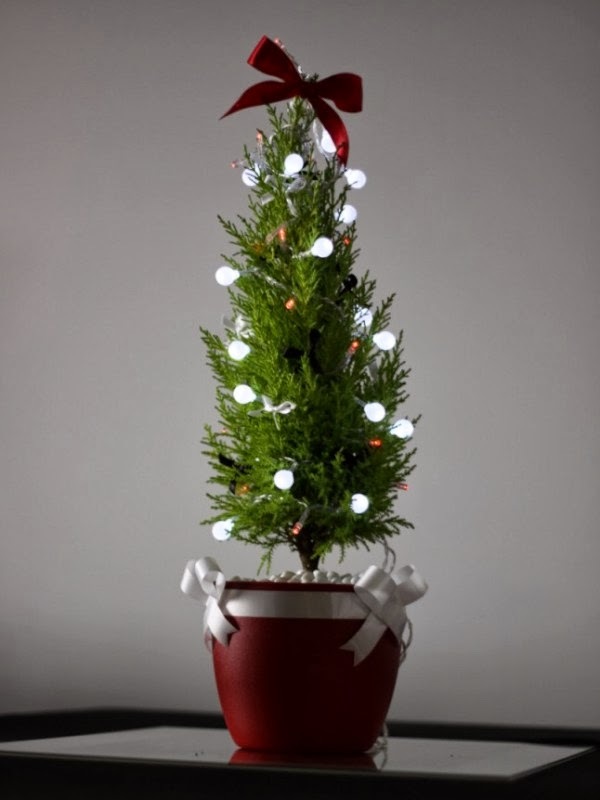 Aww what a cute little tree! That's such an awesome idea for a small space.